Sally’s unique special talents rival her natural color abilities. Her Bachelors degree in Architectural Psychology was a perfect match for her unique color talents. Feeling the space and the intended use of the space for her clients has led to many happy commercial and residential successes. Often people will start with basic floor plans and colors that appear to look good on paper but the flow and dignity of the space is often compromised but good intentions. 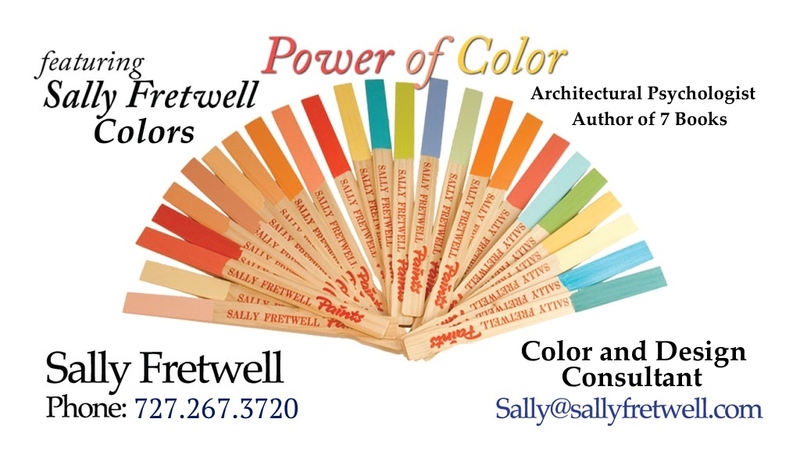 Many doctor’s offices, business spaces, homes and kitchens have been transformed by Sally over the past 30 years. Achieving the right mixture of peace and productivity is a balancing act that Sally often achieves once she has completely understood the intent of the owner or contractor. Texture, space and color are the ability to match all of the variables within the budgets of most people is a real trick that demands knowledge of the costs and various directions one can take to achieve their goals. Often this requires field work in different parts of the country to find the right material matchs for the owner. Sally often will do the initial footwork after seeing the space before accompanying the client for viewings. Her demand became so great that Sally decided to write a book called “Fung Shui Back to Balance”, which was on the Amazon best seller list for over 3 years. Sally was one of the very first people in this country (35 years ago) to practice the art and employ it in all of her work. Her success definitely shows the practice in all that she does. If you are considering a change of space whether residential or commercial, call or email Sally for some initial thoughts on your projects and save some time and money. Those who are considering adding on to their homes often ask me many questions. The majority of the questions are center around the size and location of the addition and what purpose the new addition will serve. Most people considering an addition have many option but want input on the location that will best serve the overall floor plan, balancing cost of building with future resale value. Where you can add on to your home can be directly related to the shape and direction of your existing home. Adding on can either enhance and expand the design or can impede your homes’ current “flow”. One should always keep in mind that the addition can make a huge difference in the overall floor plan. An entryway addition can make the home feel like it is a whole different home if it is expanding the entry point, which adds depth and the perspective changes. 1.Think about the amount of light you presently have in your existing home before the addition and will the planned addition open up the home to more light or more light constricting. Some additions can be a room off a room and actually cut off the natural sunlight that the room had access to before the addition. In the same vain, an addition can open up a wall that has no windows and bring light into a room that did not have natural sunlight before. 2. The location and placement of the windows in the new additions can influence how the room will feel as well. Consider taking advantage of the height of the placement of the window, placing them high enough as the filter light into the room rather than illuminating only the floor and outer part of the room near the window itself. 3. When adding a garage always remember a garage is a large space and if it is attached to the length of the house can make a house very long and therefore block light from the direction from where it is placed. So being creative is imperative. Slightly detached at an angle or with a covered walkway or windowed breezeway, can be an answer that allows easy access and allows for maximum light to enter in. A good example of what I am referring to is when you have a row on condos, the ones in the middle have no windows on two sides of the building, so less light enters in. The condos on the ends have access to light filtering in from an added direction and will feel more open, less restrictive. A couple that I have helped in the past with several home transitions, asked me to study the floor plan design they would be like to build in the near future. The garage in the floor plan took up half the house and sat on the south side of designed home, leaving no windows on the south or west side of the home. As designed, this floor plan would essentially feel like an L-shape and very dark inside due to the garage being in the center part of the house. They decided to make the potential garage into a living space instead, building a garage at a later time. In conclusion always consider the overall floor plan when planning an addition. Keep in mind, that an addition can completely transform your living space so chose wisely, considering the shape and flow of the “before and after” of the addition and how it can best enhance your present living space.